White Bird's season opens with the dancer/illusionists from Momix, performing "Alchemia"
Momix call themselves “dancer-illusionists,” not simply “dancers.” If you don’t know what that means, and have somehow avoided Momix until now, last night’s performance, Alchemia, the opener of White Bird’s season, will make the difference very clear. Momix is known for spectacular shows heavily involving custom props and costumes, often verging on what advertisers would call a “multimedia experience,” but still rooted firmly in dance performance. While many of these props are something to respond to or dance with, Momix are illusionists, so their materials are used to transform both the shape and movement of the dancers. Much of what they do is done to create a particular image or visual effect, and their performances are high-energy, wild chases from one transformation to another. There’s an excellent book that parallels alchemy and painting, What Painting Is, by James Elkins. It’s worth reading if only for the second chapter, which is about momentarily forgetting whatever you know of chemistry. Alchemy wasn’t necessarily a science. It was system of asking and answering questions about transformations and interactions of matter from a time before we had the knowledge and technology to confirm robust scientific theories about things we couldn’t directly experience. Chemistry tells us that water, steam, and ice are the same thing, but an alchemical system might put ice closer to a rock than it would steam, because of how it feels and what you can do with it. Alchemy in its various forms assigns meaning and function to various observable qualities of material and traces them to other parts of experience—genders, the stars and planets, gods and demons. Reading the old descriptions, it’s not clear how metaphorical these associations are supposed to be. To interpret it you have to have a willingness to participate in the metaphor/illusion, and maintain a good humor about it. This makes alchemy the perfect motif for a company as full of transformation, spectacle, and amusement as Momix. The company creates illusions, but usually with a healthy dose of what the artist Vik Muniz would call the Worst Possible Illusion: an illusion where you can be engaged in the process of illusion without having to necessarily be fooled by it—knowing what’s behind the curtain yet still experiencing a thrill at the whole operation, curtain stage and all. Half the fun of the illusion is thinking about how they do it. Alchemia has a dizzying number of costume, set, and prop changes, all without an intermission. The dancers progressed through representations of the alchemical elements and seemed to even reference some lab techniques. The troupe transformed into a roaring fire, appeared to compress into bars of new substances, and the highly amusing opening sequence with giant cardboard tubes even seemed to reference the magnetic stirring bars commonly seen in beakers in labs. Some of the more affecting sequences were less abstract and worked with the personification and sexualization of these transformative processes. The most laugh-out-loud moment involved two male dancers bursting in to interrupt a delicate, deliberately-feminine sequence. They wore a sort of stretched armature that split their silhouettes into something between a bodybuilder, a horse, and a children’s toy. Every movement was hilarious. Later, a male-female duet used some of the most lyrical, understated, and flowing wirework I’ve ever seen. The dancer skated across the stage as if she were weightless and leapt impossibly. In a show bursting with innovation and spectacle, this sequence succeeded simply on timing and balance. To that end, I would turn the music down on the whole show. Seventeen tracks at a pretty generous volume are crammed into 80 minutes, pushing the tone of scenes a little too much in whatever direction the current track was going. Momix achieves tremendous effects with relatively simple but wildly-inventive costumes. There’s a smart humor in the play between these effects and the audience’s instinct to analyze how they achieved them. Occasionally I think the soundtrack got in the way of that free sense of play, but Momix is a big, popular troupe that creates unique spectacles, so I can understand why they crank it up—it works. But I don’t think it’s quite necessary. Of course, there were definitely moments that fit the Big Loud and Profound soundtrack. At one of the peaks of transformation, when the entire company was engulfed in a shimmering, stretchy, tense blob of fabric that covered the whole stage, they did things with light and movement that seemed impossible. A shiver went through the crowd when a face, then a body, then another face pressed out from the blob. An excellent transformation. I knew all the parts, and how they did it, but I couldn’t believe my eyes. 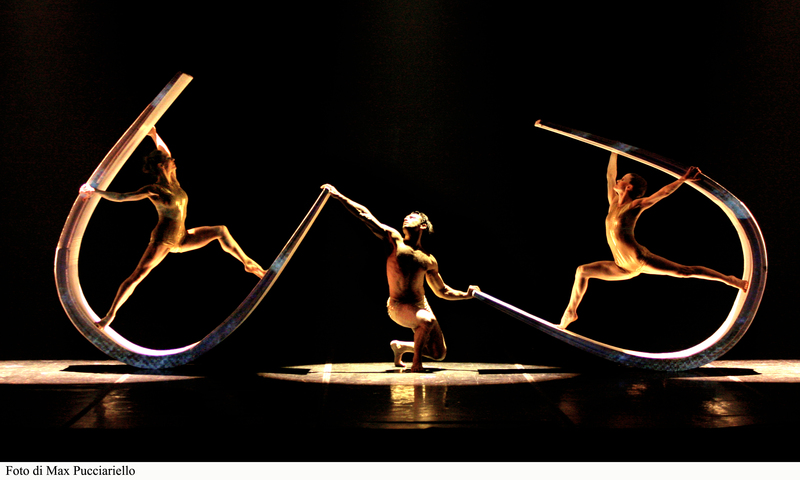 Momix performs at 2 and 7:30 pm Saturday, October 10, at the Newmark Theatre, 1111 SW Broadway.